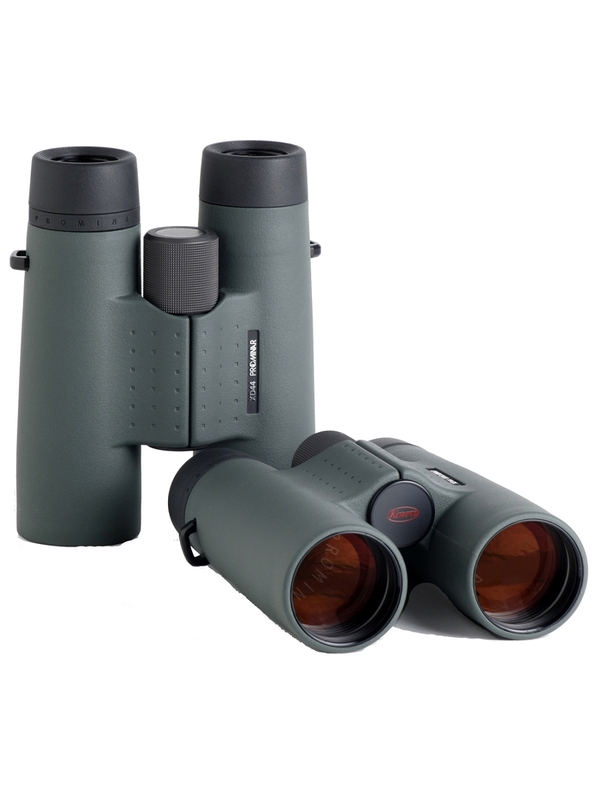 The Kowa Genesis 8.5x44 Binocular marks the peak in Kowa's line of roof prism binoculars. It is engineered for the utmost in performance, viewing quality and durability. This binocular is an optical luxury worth every penny as it easily holds its ground with other brands of premium sport optics. 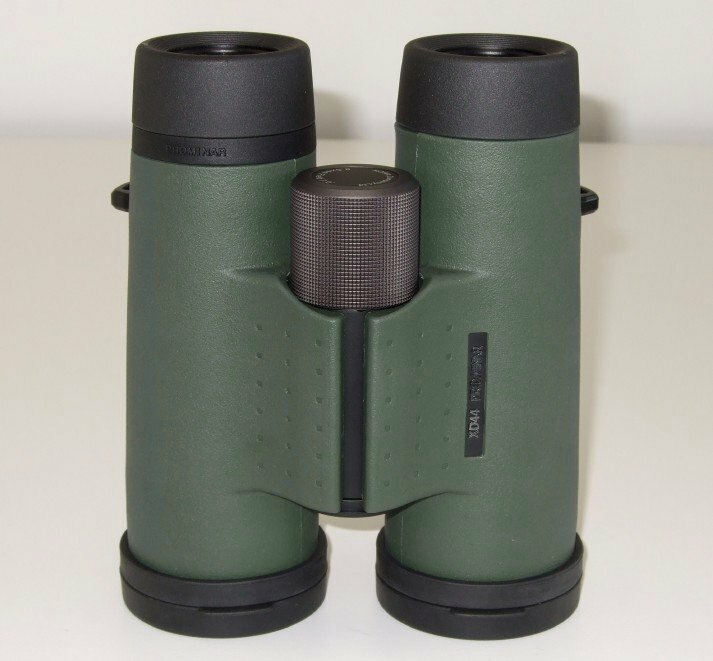 The 8.5x44 binocular mates Kowa's own Prominar ED glass to minimize chromatic aberration with C3 optical multi-coatings that allow an unheard of 99% transmissivity of each element between 400 and 700 nm, a feature that is very helpful when spotting birds. Most other units competing in the Genesis' range average 95%, and as such, the Genesis series binoculars certainly stand out from the crowd. All Genesis series binoculars feature a lightweight yet extremely rugged magnesium frame that is the foundation of the waterproof and fogproof body. Optically, the unit can focus down to an amazing 5.5' and the boost in objective lens size from a more common 42mm to 44mm provides a clear view that is 10% brighter. Internal focusing aids in keeping the overall operating size from becoming unwieldy. While the price tags of current high-end binoculars seem to increase faster than ever, it becomes more interesting to take a look at the second quality line offered on the binoculars market. Fortunately, there are a couple of new models coming up these days, and the present review is going to compare three samples of the price range from 500 to 1000 Euro. I have selected these models because they they seem to offer a particularly favorable performance to price ratio, and since they cover a wide price range, they do, quite naturally, differ in their performance. But apart from their relative performance, it will also be instructive to compare them with the high-end binoculars, and to judge to what extent the much higher prices asked for the prime division are actually justified. 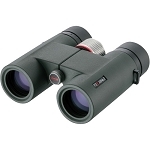 Along with the 10x42, the 8x42 class is highly popular among bird watchers and other nature lovers. Here, the lack of high magnification is compensated with a larger exit pupil beyond 5mm, which makes the binocular suitable for low light observations. Additionally, the 8x power can still be managed in hand held mode, since a shake-free image is achieved without the need of any support by cumbersome tripods or monopods. Last not least, these binoculars, if well designed, offer fairly wide fields of view beyond 7 degs which makes it easy to survey large areas and to follow moving targets. 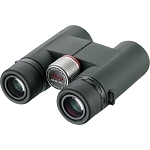 In recent years, Kowa has established a line of spotting scopes which is highly regarded among bird watchers. With the new quality line of binoculars, called the Prominar XD (in US: Genesis), which currently contains a 8.5x44 and a 10.5x44, Kowa is intending to challenge the high end contenders of Zeiss, Leica, Swarovski and Nikon. The specifications are impressive: Objective with 4 lens-elements (two of them made of XD, i.e. extra low dispersion, glass), a 5 lens-element ocular, and the Schmidt prism system contains a dielectric reflective surface with 99% reflectivity. A close focus of 1.7m is specified, and there exists a filter thread at the objective end which takes standard 46mm photo filters. 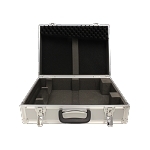 The entire construction is embedded into a magnesium alloy frame, is fully water proof and nitrogen filled. 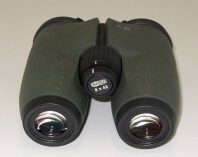 This binocular is produced in Japan, and its price is slightly exceeding the 1000 Euro line. Meopta is a factory located in the Czech Republic. The Meostar B1 is a recent development, located in the higher middle class price segment. 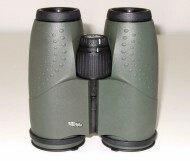 The stubby and compact body contains 4 lens-element objectives and oculars. On the Meopta web-page, I have found a sketch which indicates another lens just in front of the prism-entrance, most likely serving as a field flattener. The body is made of aluminum, filled with nitrogen and fully water proof. The Meostar B1 line currently contains a 7x42, 8x42, 10x42, 7x50, 10x50 and 8x56. The price of the 8x42 is between 850 and 900 Euro. 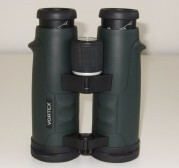 Vortex is is an optics dealer located in Middleton, Wisconsin, USA. The Razor is a new model, based on the open hinge design which was first introduced by Swarovski. Although the imprint reads 'Made in Japan', several independent sources have claimed that this binocular might be assembled in China while adhering to Japanese quality control. The objective lens is touted to contain XD glass, the prism system contains a reflective silver layer, and the aluminum/polycarbonate chassis is fully waterproof and filled with argon. To my best knowledge, the use of argon as a dry and inert filling does not offer any significant advantages over nitrogen. Interesting are the eye-cups which can lock at any distance between 1 and 16mm, and which are extremely convenient to use. The Vortex also comes with interchangeable eye-cups which feature a shield to prevent stray light from the side, but these eye-cups have got a fixed ocular distance. The Razor line contains the 8x42, 10x42, and the 8.5x50, whereas another 10x50 and 12x50 are planned. 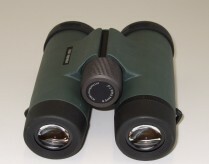 The 8x42 is a classical medium quality-range binocular and available for about 500 Euro. The following table summarizes some of the specifications of the contenders. Angle of view: The Meostar and the Razor both offer a reasonably wide 63 degs. of apparent field. The Prominar, with 59 degs., is not far behind. For comparison: The 8x42 Zeiss Victory FL offers 62 degs, the Leica 8x42 Ultravid 60 degs., and the Swarovski 8.5x42 EL 63 degs. Image sharpness: All quality binoculars offer a sharp and crisp image at least near the central region of the field, and there are rarely any significant differences discernible. In this matter, the Kowa Prominar is surely special, since contrast and definition of its image are outstanding. I have observed power lines at a distance of 1/2 km in front of white clouds, and the cables were, through the Meopta and the Vortex, imaged as very fine, grey lines. This implies a high resolution of these binoculars. The Kowa, however, displays the same lines in deep black color, indicating an exceptionally high degree of contrast. This is most likely the result of an improved suppression of chromatic aberration. Towards the edge of field, the star test reveals the first signs of blur about 75% (radial) from the center. Near the edge, however, this blur remains moderate, so that under less critical viewing conditions under daylight one may sometimes get the impression of the Prominar being sharp almost to the edge. A similar fraction of point-like stars is also offered by the Meopta, which has also got a somewhat larger field of view. Near the edge, stars display a little more deformation due to astigmatism, but not too excessively so. The Vortex is somewhat behind, with about 65% of point-like stars it is just average. The edge sharpness of both Kowa and Meopta are on Leica and Zeiss level, only the Swarovski 8.5x42 EL, which is almost reaching 90% of radial field with point-like stars, is clearly superior. Regarding contrast, the Kowa is definitely challenging the best of the best. Image color: A completely neutral image is produced by the Kowa. The Meopta and the Vortex both display a slightly warm image tone. It is not adequate to talk of an image tint, however, since the bias towards yellow is tiny. Still, some professional birders may be asking for the perfectly neutral color rendition which is offered by the Kowa. Additionally, the Kowa is also offering threads at the front end of the objectives, where standard 46mm photo filters can be attached. This feature allows for further variations, depending on the viewing conditions. For example, polarization filters may be useful when observing a shiny water surface, or yellow filters may be used under bright sun, in particular over snow, in order to reduce the eye-strain. Rectilinear distortion: The Meostar is showing the usual degree of pincushion distortion. As was discussed here, this distortion is useful in order to compensate for the globe effect when panning over wide areas or when tracking a moving object. In fact, the background is moving very smoothly when the Meopta is used to scan wide areas for interesting objects. To the contrast, the Kowa has got a very low degree of distortion, and while panning around, the globe effect is clearly visible. The Vortex Razors correction is in between both extreme cases; a straight line displays a little inside-bending when shifted near the edge of field, indicating a small amount of pincushion distortion, and the same binocular also shows a mild degree of globe effect. This description shall not imply any judgment: It is a matter of design philosophy, whether one prefers to correct for pincushion distortion (and hence tolerates the globe effect) or vice versa. Leica, Zeiss and Swarovski employ a pincushion distortion at the same level as does the Meopta. The Nikon HGL is, in this regard, rather similar to the Kowa. Stray light: Stray light is generated whenever light finds its way through the instrument into the eye through an unforeseen path, for example as a reflex at the internal tube, a prism or lens edge. 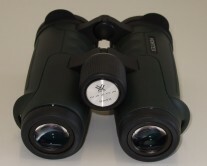 Top class binoculars often differ from their medium range competition in their ability to suppress stray light under difficult light conditions. In this discipline, both the Kowa and Meopta show an excellent level of performance. Even the Vortex, though somewhat behind both competitors, suffers from stray light only under adverse conditions, and the stray light intensity remains low and does never dramatically reduce the contrast of the image. At least the Kowa and Meopta are here fully competitive with the high end competition. Ghost images: If, at night, a bright object (street lantern, moon) is positioned into the field, reflections on the air-to-glass surfaces take place, which can lead to multiple 'ghost' images of the light source. A successful suppression of these ghosts indicates a high quality of the anti-reflection coating. Here, all three competitors display a high degree of resistance against ghost images. It appears that the Kowa performs slightly better than both Meopta and Vortex, but there is another effect which is characteristic for roof prisms: As a result of diffraction at the roof edge, a bright point-like source is producing a single 'spike', and since both prisms (left and right tube) are oriented under different angles, both spikes form a cross-like structure when the light source is of sufficient intensity. The intensity of these spikes may be related to the accuracy to which the roof edge is cut, and hence it differs from instrument to instrument. In the present test, the Kowa displayed spikes of marginally higher intensity than its competitors, and this fact eliminates its advantage of having the most effective coating. During an earlier comparison, I have seen the same spikes through a Leica Ultravid and a Swarovski EL, but through the Zeiss Victory FL these spikes were less intense. 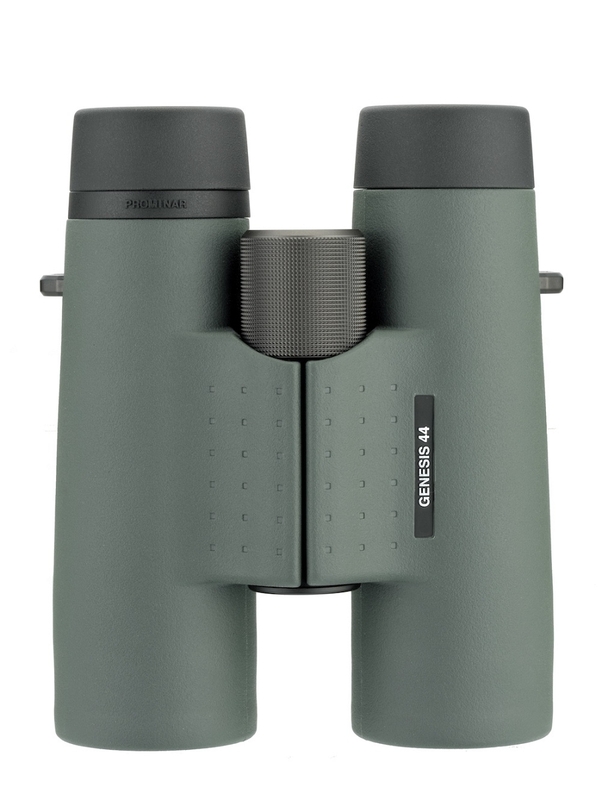 In such a test, however, only Porro binoculars are able to deliver a perfect image, and I have experienced that kind of perfection with the Swarovski 7x42 Habicht. Low light performance: Since all three competitors have got roughly the same exit pupil size, and all of them are using high quality coatings and hence may not significantly differ in their overall transmission, major differences in their low light performance should not be expected. In fact, my test did not reveal any significant differences here. The outstanding contrast of the Kowa under daylight conditions is apparently not of the same efficency under low light conditions. I suspect that all three contenders perform about as good as a quality 8x42 binocular can do under low light. The most important features are quickly summarized: All three binoculars are fully waterproof, protected with a durable rubber skin, have got a long eye-relief for use with eye-glasses and a short close focusing distance (Kowa: 1.7m, Meopta: 3m, Vortex: 2.5m). When comparing their weights with the current high-end (Leica Ultravid: 790g, Zeiss Victory FL: 775g, Swarovski 8.5x42 EL: 820g), it is obvious that the lower priced binoculars are more heavy, and the weight difference is of the order of 100-200g. The objective covers are attached and cannot be lost in action. The central focuser of the Razor is working smoothly and precisely, but the diopter correction, activated after pulling out the focusing barrel, appears too stiff so that I can hardly operate it with a single finger. It is interesting to note that the Razors focuser is turning reversely: A clockwise turn is focusing near, usually it is the other way around. The Prominar has got a huge focusing barrel which is easily accessed, and the diopter setting is done with a ring near the right hand ocular. With my sample, this ring had got a little amount of mechanical play which took away a bit of the focusing accuracy. The central focuser of the Meopta is somewhat smaller, but coated with anti-slip rubber, and working with high precision as well. I find the Meoptas short body most comfortable to hold and to operate and I do in fact prefer it to the open hinge construction of the Razor or the long body shape of the Kowa. On the down side, the Meostars eye-cups cannot be locked at any intermediate positions. Fortunately, they operate with a considerable friction and won't easily turn without intention. 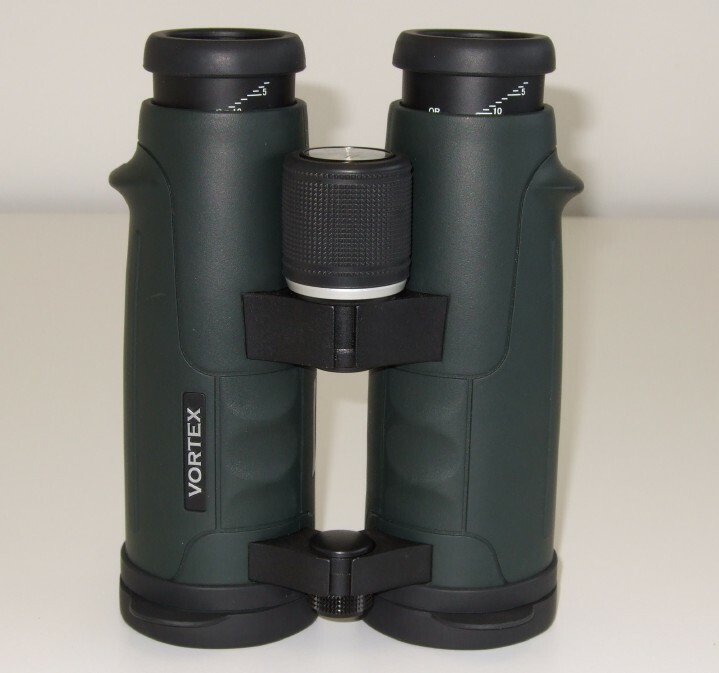 The Kowa has got 4-stage interlock eye-cups, and the Razor can even be locked at any distance. There is also a distance scale which helps to find the optimum setting - an excellent idea which should become a standard for any new binocular design. Another excellent feature is the Kowas filter thread in front of the objectives, where 46mm filters can be attached. Kowa might consider to offer screw-in lens hoods as additional gadget for use under most difficult light conditions. Altogether, the built quality of the test candidates is on a pleasantly high level, but it is not possible to judge whether or not they would be on par with the absolute high end. It would perhaps take several years of serious use and abuse to figure how well their constructions can survive in the long run. The following table is supposed to summarize the above observations. 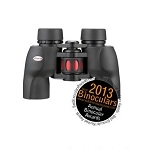 The best performing binocular gets three points, the following contenders two and one, respectively. In case several of them perform equally well, the scores are averaged. Altogether, the Kowa Prominar XD does without any doubt deliver the best optical performance. Most of all it is the outstanding contrast, a result of the successful elimination of chromatic aberration, combined with a top class stray light protection and a perfectly neutral image tone, which make it a serious competitor to the high-end. I think it is not so much the optical quality of its image which would separate the Kowa from Zeiss/Leica/Swarovski, but rather its higher weight and a couple of percent smaller field of view. Everybody who is considering to spend a lot of money for a top class binocular has now got the alternative to save several hundreds of Euro and to choose the Kowa, thereby carrying 150g extra weight and sacrificing a little bit of field of view. The Meopta Meostar B1 is an excellent performer within the sub-1000 Euro class. There was no weak point, it displayed a very balanced performance over the entire range of different tests. Its image is pleasantly wide and plane, with a fairly high level of edge sharpness, which makes it an interesting candidate for astronomy. Throughout the test, this binocular was never suffering any significant stray light, and its body shape promotes a stable and steady hold in free hand mode. I would rate the Meostar above the Docter 8x42 B/CF, in particular because of its superior stray light suppression. The Vortex Razor can be bought for 500 Euro, half the price of the Kowa, and not surprisingly it is a little behind its competitors in some of the disciplines. 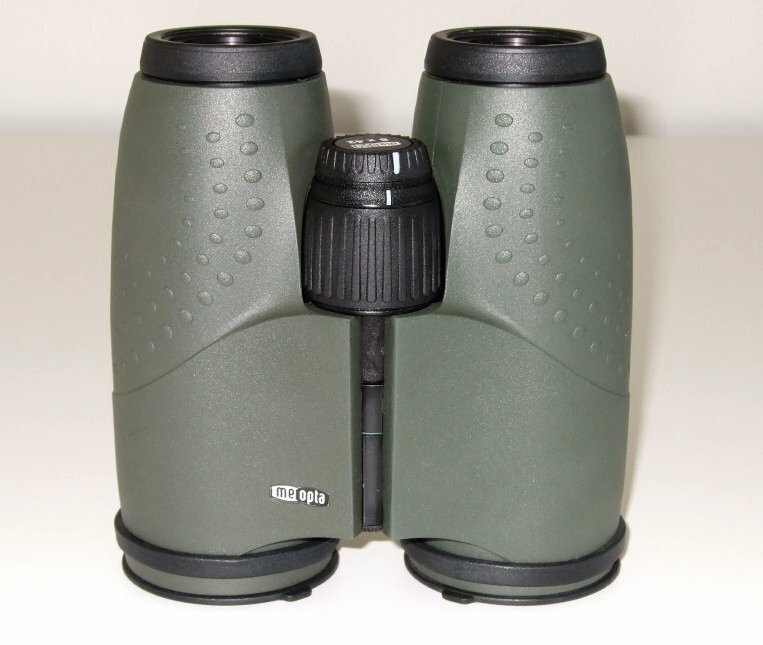 But for its price tag, it serves as an excellent alternative for those who want to invest into a medium price range binocular and who are looking for the best performance available in that class. The Razor is of very good built quality, has got a state of the art coating and offers a pleasantly wide field of view, although the image quality is diminishing towards the edge. Altogether this is a very good all around binocular which should be able to survive even the harder outdoor adventures without any problems.